Independence is ours!!... Now what?? Even though we had won our freedom from Britain, we still weren’t a united nation. Every state had their own ideas about how the country should be run based on their own needs and desires. People were afraid that, if the national government was too strong, it would just like having a king all over again. However, despite this fear, they did agree that they needed some sort of unifying, federal government. So they entrusted John Dickerson with the drafting of a federal constitution. 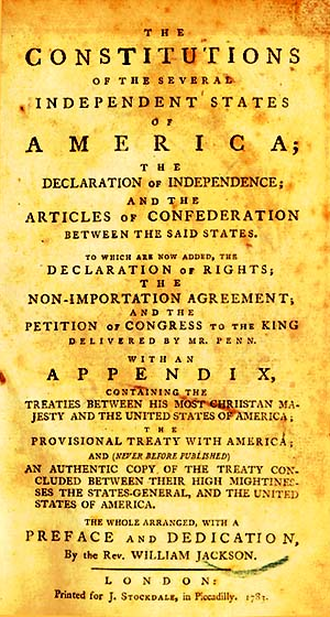 The document that he created is known as the Articles of Confederation. The Articles of Confederation became the ruling document in the new nation after they were ratified by the last of the 13 American states, Maryland, in 1781. The Articles created a nation that was "a league of friendship and perpetual union." The state governments retained most of the power under this framework, with a subordinate position given to the central government. As is often the case with the first version of something, government 1.0 had a lot of problems. 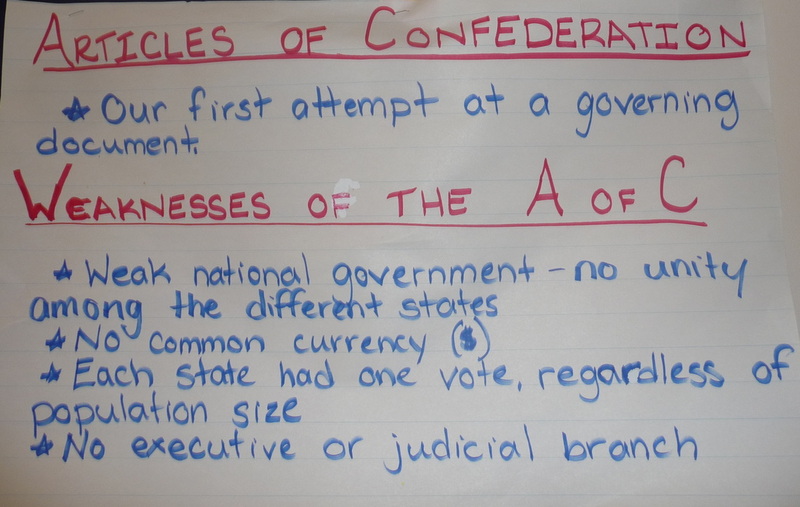 Here are the major weaknesses of the Articles of Confederation. The central government commanded little respect and was not able to accomplish much because it had little jurisdiction over states or individuals. There was only a unicameral legislature, so there was no separation of powers. The new congress had no power to tax, so they could not pay back debts and put their finances in order. Congress could pass laws, but it could not make the citizens follow them. The Articles required unanimous approval of the states to make any changes and, as we know, it is almost impossible to get everyone to agree on anything! The federal government wasn’t powerful enough to settle disputes between the states over trade and land ownership. It was every state for itself! There was no common currency, so the money from one state couldn't be used in another. In the words of George Washington, the government created by the Articles of the Confederation was "little more than the shadow without the substance." As the need for a stronger federal government began to be realized, leaders from throughout the states got together to decide how to create it. 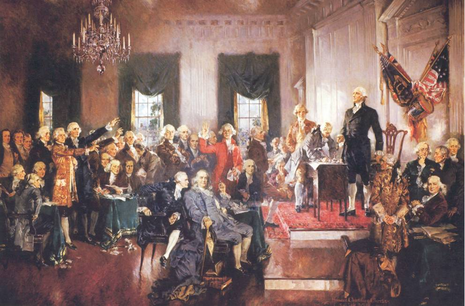 The Federal Constitutional Convention of 1787 was responsible for drafting the Constitution of the United States, the document that took the place of the Articles of Confederation in 1787. Click on the links below to learn more about The Articles of Confederation. The Constitutional Convention was supposed to begin on May 14, 1787, but only delegates from three different states arrived in Philadelphia on time. It was May 25 before all the delegates arrived. The delegates arrived by all different means of transportation, but the most interesting was Benjamin Franklin. He arrived in a Chinese sedan chair carried by four prisoners from the Philadelphia Jail. At the age of 81, he was also the oldest delegate at the convention. James Madison held an important role in the convention; he was the recorder. He spent all day everyday writing down everything that was said. he only took a break when he had something to say. Another important person was George Washington. He presided over the convention, settling disputes and brokering compromises. Once the Constitution was ratified, he was unanimously elected as the first president of The United States of America. It was incredibly hot in Philadelphia that summer and, since air conditioning hadn't been invited yet, the meeting room was stuffy and almost unbearable. Normally, they would just open the windows, but, because they wanted to keep the proceedings private, they kept the windows closed. As we know, when people get hot, they get grumpy! The Constitutional Convention almost came to blows numerous times, but, fortunately, "cooler" heads prevailed. Here is a chart that shows some of the major disagreements and the arguments for and against. Our founding fathers realized that, if they were going to get anywhere, they were going to have to compromise. There biggest disagreement came over how much power should be divided in the government. Should the states get votes based on population or should everyone get the same amount? Two different plans were presented, the Virginia Plan and the New Jersey Plan. The Virginia Plan stated that the number of votes should be decided based on the population of the state. The New Jersey Plan said that every state should get the same number of votes. After a month long stalemate, the heat wave broke and so did it. 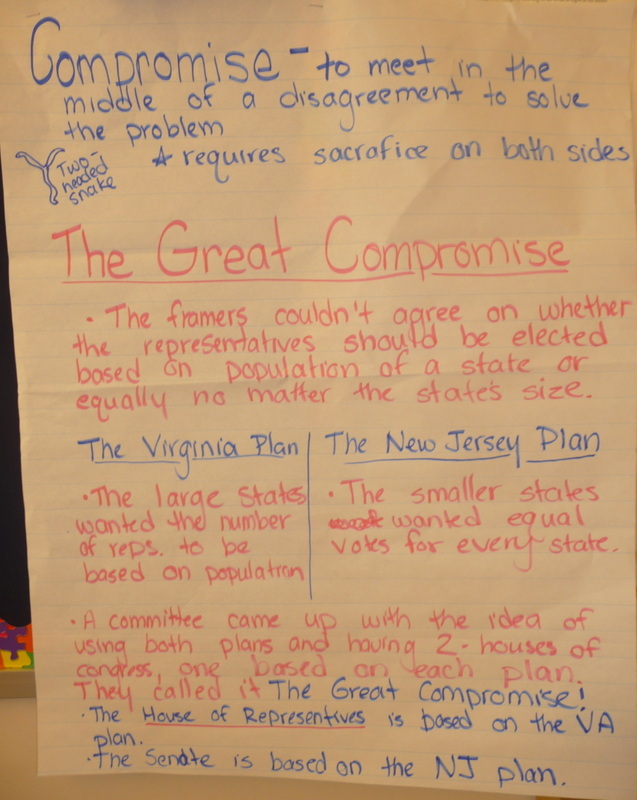 The delegates reached an agreement that would come to be known as The Great Compromise. They agreed to have two houses of congress, one based on each plan. The House of Representatives is based on the Virginia Plan and the Senate is based on the New Jersey Plan. It was also decided that there would be three separate branches of government, the judicial brand, the legislative branch and the executive branch. Scroll down to learn more about our system of government. Just when they thought the major disagreement were behind them, a new issue arose. The southern states thought that slaves should be counted as part of a states population, but the northern states said, "NO WAY!!!". They soon realized that another compromise was in order. It was decided that 3/5ths of the slaves would count in a states population. This is known as The Three-Fifths Compromise. What do you think about the decision they made? Watch this video to learn more about our founding fathers. Throughout the convention there were two main opposing groups, the Federalistsand the Anti-Federalists. The Federalists felt that the Constitution was perfect they way it was. While the Anti-Federalists felt it needed a bill of rights to specify the individual rights of the people. They argued back and forth, but eventually it was decided that the Constitution would be sent to the people without a bill of rights with the understanding that one could be added later. Once all the issues were resolved, it was time to formally write the document. Once a rough draft was crafted, it was sent to the Committee of Style and Arrangement who polished up the language and created the final document that exists today. The final draft of The Constitution was presented to the American public on September 17, 1787. Now it was the states' turn to ratify The Constitution. The Constitution stated that 9 of 14 states (Vermont had already become a state)had to ratify it before it would be come law. The state legislatures held conventions to review the document and make a decision. 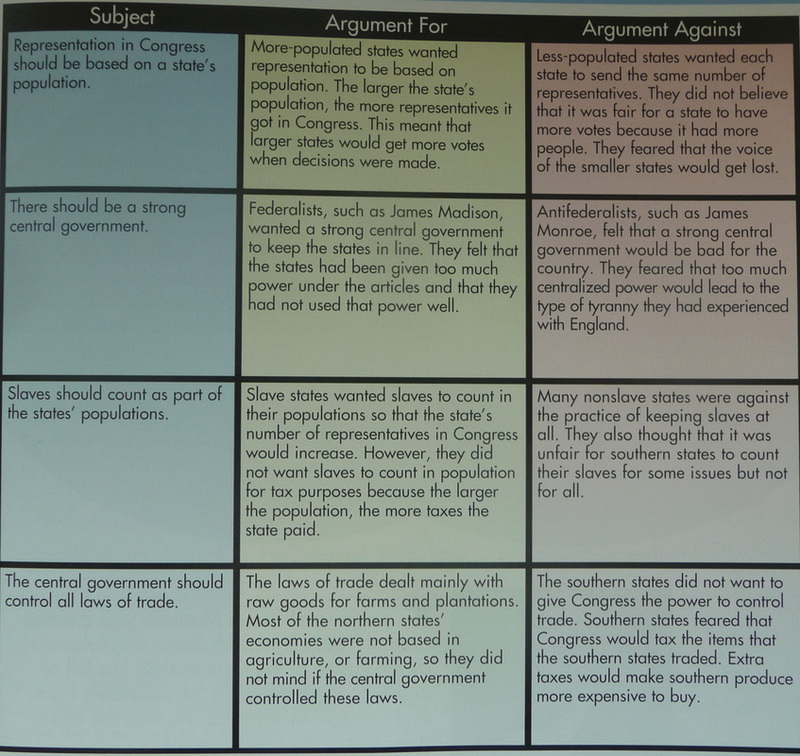 The Federalists and Anti-Federalists in each state argued their points, but the Federalists eventually won out. On June 21, 1788 New Hampshire became the 9th state to approve the Constitution. However, to appease the Anti-Fedrealists, many states sent recommendations to the new congress for amendments to be added. Congress took those recommendations and turned them into The Bill of Rights. Here is a website where you can learn more about the Federalists vs. the Anti-Federalists. Here is a fun Schoolhouse Rock video on the Preamble and the Constitution. Now we officially have a government!! Let's learn more about it!! After their experience with King George, the delegates were afraid of any one person having too much power in the government. In order to prevent this, they created a government based on separation of powers. Each has its own responsibilities and at the same time they work together to make the country run smoothly and to assure that the rights of citizens are not ignored or disallowed. They did that by creating a system of checks and balances. A branch may use its powers to check the powers of the other two in order to maintain a balance of power among the three branches of government. Click here to learn more about the roles of each branch of our government. Once The Constitution was ratified, congress adjourned to write the Bill of Rights. James Madison, a Federalist himself, realized that, if the new U.S. government was going to succeed, the Constitution needing a bill of rights. He quickly drafted twelve amendments and presented them to congress. They were all designed to protect individual rights and were based on several different state constitutions. The new congress quickly approved them and sent them to the states for ratification. By 1791, the states had approve ten of the twelve amendments. One of the two that wasn't immediately ratified was eventually approved in 1992!!! It is the 27th amendment. Click on the links below to read more about each of the amendments in The Bill of Rights.